I am in the middle of my very first bankruptcy and have learned many things from the mistakes I had made. I never had credit cards or anything but I did have loans and payments that just never got made due to terrible circumstances that changed many things in my life. I am now recovering from my poor decisions and had wonderful words of wisdom brought to me by my counselor. He taught me how to rebuild from my bankruptcy and begin climbing up the ladder to being a responsible credit holder. And now I get to share this information with you. 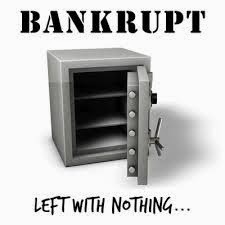 Once you are getting close to the end of your bankruptcy you can look into getting a "secured credit card" which is a card where you put down a deposit and the credit card company keeps it as collateral in case you decide to stop making payments. The deposit is usually around 300 and they will give you a credit limit of around the same amount varying by card of course. The trick to rebuilding with this method is you must use your card every month, whether it is something small like a pizza or bigger and you must pay it off in full on time every month for the next 12 months. Do not stop using the card every month because it brings your credit score back down when you stop using it. After making your payments on time every month for 12 months the credit card company will give you your deposit back to do as you wish and now you have proved to be an excellent creditor. You may be able to get a larger spending limit but be careful because that's how you get sucked into problems again. Another way I was shown is to wait until you are discharged from your bankruptcy, when you receive your discharge certificate take it in with you to the bank and see if you can borrow $1000 to buy an RRSP. The bank may or may not allow this and if they do that is wonderful. The payments on a loan for an RRSP are very low ranging between 2-5% over a twelve month period making your payments very low. As you make your payments each month be sure to make them on time and you can even pay more then your minimum to pay it off faster if you can. By the end of the year when you file your taxes you will get an income tax credit of $330 which you can add into your RRSP account. Now this account will begin to gain interest and if you finished paying off the original loan amount you can borrow another $1000 or even $2000 from the bank to put more towards your RRSP. This will create a snowball affect creating this RRSP amount to grow by leaps and bounds over the years. You can choose to keep the money for retirement, use it for your or your child's education, or even a first time home purchase. The amazing things you can do with compounding interest is endless. Those are two ways you can begin building your credit after a bankruptcy or even now if you have fair credit but nothing to fantastic. Make your payments on time and show you can be a responsible credit holder and soon you will be back in good terms with the credit world. Beware that when you begin gaining a good credit record all kinds of creditors begin coming out of the wood work offering credit cards and even those pesky furniture stores can offer what seems like a great deal at the time (no payments for 18 months) but don't get lured into owing money to more places. You can live life simply by loving who you are, what you have, and what you can do. Be proud of what you have achieved and know that you don't need shiny, fancy new things to be amazing.